I'm really trying to keep my nails looking lovely and give up the horrible habit of biting the skin around my nails. With that in mind, I've been using some products to help give me nice nails. 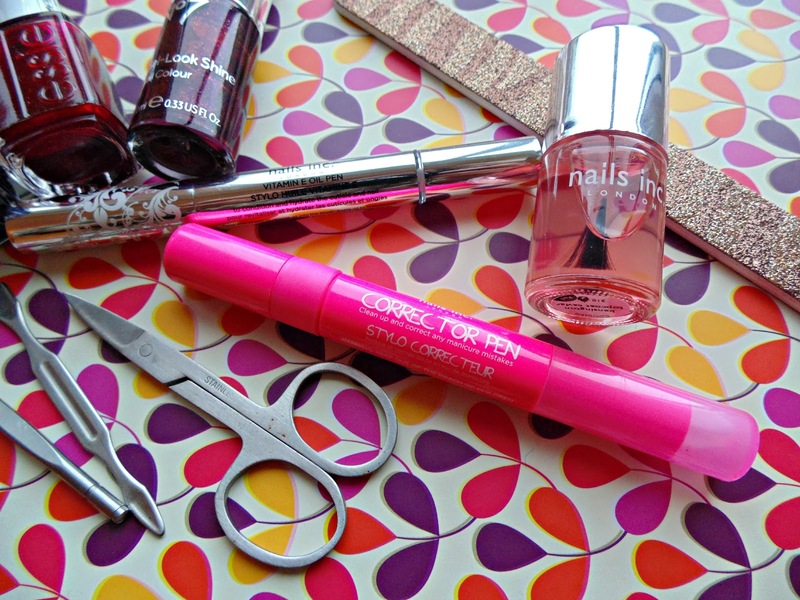 The Nails Inc Corrector Pen* is amazing and great at tidying up a quick paint job. If you are guilty of carrying out a last minute varnishing then this is for you. You get spare nibs to replace, but they last a long time and it's definitely worth the £10 pricetag. 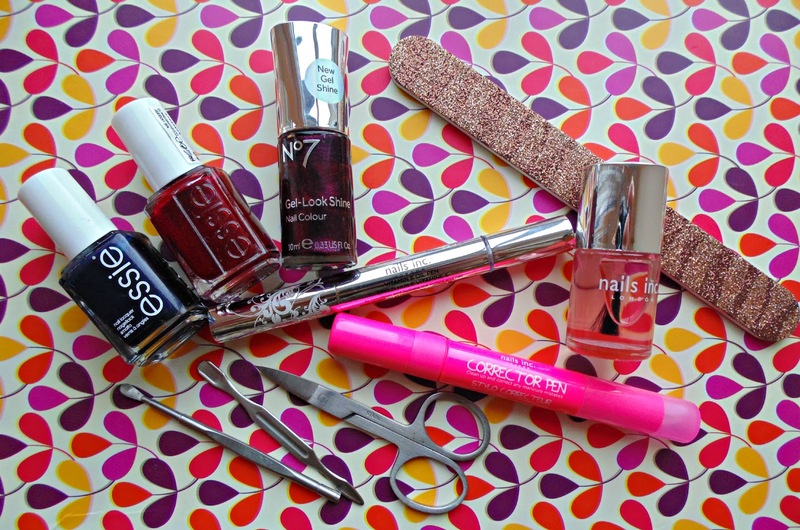 I've also been loving the Nails Inc Vitamin E Oil Pen £12 - I suffer with really dry cuticles and this is great at helping keep them moisturished. I usually keep this in a little jar by my bed and dab it on. It smells amazing! 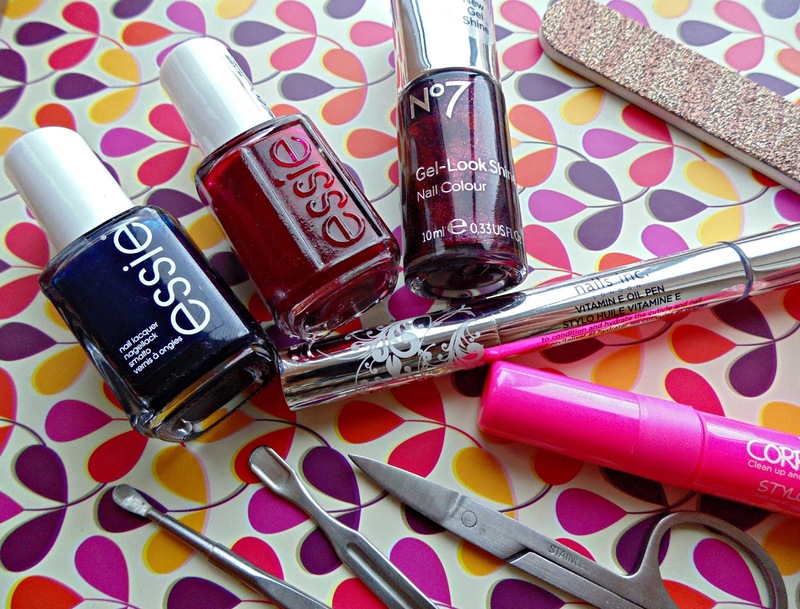 Next up nail varnishes, I prefer darker shades and Essie have come up with some beauts over the years. I don't mind a little shimmer so when I got a No7 gel look polish in Galaxy it went straight into my favourites. Along with a good top coat. Nails Inc Kensington Caviar - a repurchase after getting a goody bag sample and something I don't think I'd ever sway from. Leaves nails shiny, protected and dries super quick. I always have a nail file on me just in case a nail snags or breaks. Whilst my nails are quite strong, I find using hair products, having them in water and day to day being clumsy that I tend to snap one at least once a week.